My name is Alex and I’m a freelance writer, editor and proofreader. I have a PhD in English Literature/Theatre History and I’m currently re-writing my thesis into a book for publication! 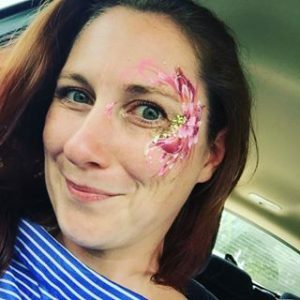 I live in Harlow, Essex with my husband (Leo), youngest stepdaughter (18), and two children (aged 6 and 4). Oh and we have another baby on the way this summer! When my son, Jackson, was a toddler, he was OBSESSED by The Gruffalo and The Gruffalo’s Child by Julia Donaldson and Axel Scheffler, and boy do I mean obsessed. As well as reading them throughout the day, we had to read them every night, speaking increasingly softly as he dropped off to sleep! He loved the rhyming pattern and the sounds of the words. After a few weeks, my husband and I knew all the words and could recite them in a doze as we read on the end of his bed. 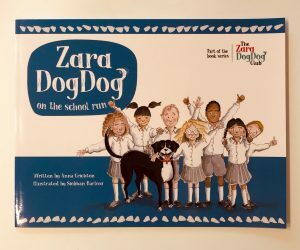 This lovely book is the first in a series called ‘The Zara DogDog Club’ which is designed to teach children how to behave around dogs. Children of this age are very focused on themselves and the things which make them happy but the story is told from the perspective of the dog which helps kids see how their own actions might make a dog feel. The story starts with Zara DogDog being awoken by an alarm clock. It’s time for Amelia and Isaac, her owners, to get ready for school. Excited at the prospect of a big walk, she paces around waiting for them and then heads excitedly out of the door. She really enjoys the walk with all the sights, sounds and smells but when she gets to the school she becomes scared. Lots of loud children run towards her and try to touch her and she doesn’t know if they are friendly. Frightened, she lets out a growl. 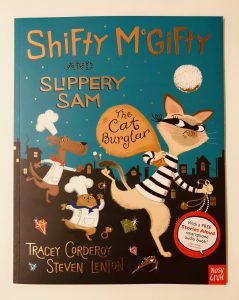 We are huge fans of the Shifty McGifty series here. In the very first book, we saw Shifty and his best friend Sam give up their life of crime and open a cafe when they discovered they were much better at baking cakes than robbing houses. In this fantastic sequel we see them use their skills for good as they help track down an infamous cat burglar. The story begins at the newly-opened cafe, where all of the local dogs gather for a good gossip, a coffee and some cake. They begin to discuss the fact that a notorious robber called Kitty Le Claw has been spotted in town and and has been causing lots of trouble. Kipper is undoubtedly one of the best-loved characters in children’s literature and this year he is celebrating a very special birthday. The little pup has just turned 30! 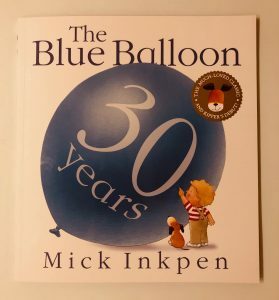 To mark the occasion, ‘The Blue Balloon’ (Kipper’s very first adventure) has been re-released in a shiny new anniversary edition. When we first meet Kipper he is carrying a soggy little blue balloon. He takes it to his owner, a small boy, and together they play with it. It’s not long before they realise that it is a very special balloon indeed. They squish it and squash it and kick it and stretch it but it just doesn’t burst – not even when Kipper tries to bite it! It changes shape all by itself and one day it floats so high that Kipper and the little boy find themselves up amongst the stars! 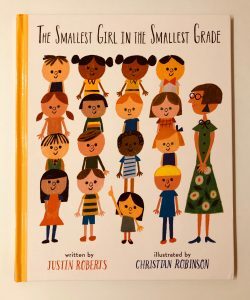 Sally is the smallest girl in the school, which means that most of time people don’t notice her. She passes unseen in the school corridors but she is very special because she notices absolutely everything. She sees the tiny details all around her, but most importantly she sees the people and how they behave with one another. She watches as the children are unkind to each other in the playground, and she notices how this makes the bullied and excluded kids feel. She watches as mean words are exchanged and tears fall. And then one day Sally decides she’s had enough. The tiny little girl steps out of the lunch line in the cafeteria, raises her hand in the air to quieten the room and then she opens her mouth and tells everyone what she has observed and how it should change. She expects to be laughed at but one by one she sees hands slowly rise in to the air in solidarity. We are a family of 4, my husband and I and a 4 year old darling girl and a 6 months old ravenous boy – he loves his milk! The adjustment from 1 child to 2 children was certainly a shock to my system! 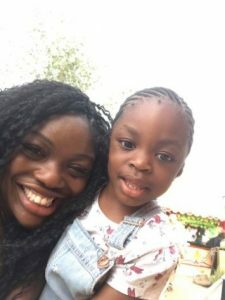 I am Kemi, a children’s therapist and an emotional well-being coach. We live in Barnet and absolutely love it here. The first book that sprung to mind when I saw this question was ‘So Much‘ by Trish Cooke. ‘So Much‘ is a lovely story about mum and baby waiting for dad’s arrival and whilst they wait different members of their family arrive and engage with the baby in various funny and loving ways. Then there is a surprise at the end. 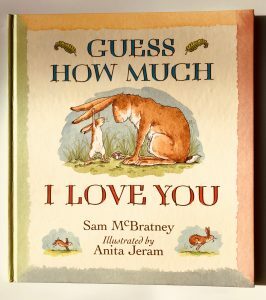 This book was a firm favourite with my daughter from about 7 months until 2.5 years old, I can recite the story off by heart. 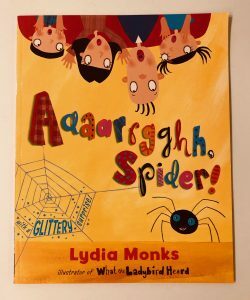 The little spider in this book is very lonely – all he wants is a family of his own. So the enterprising little fellow finds a family he likes and sets about trying to become their pet. The problem is that they’re all scared of spiders! He tries to impress them with his dancing, he shows them how nice and clean he is by hanging out in the bath and he builds a web and catches flies to prove he’s self-sufficient and can feed himself. However every time they seem him they yell ‘Aaaarrgghh! Spider!’ and throw him back outside. Feeling defeated, the poor lonely spider decides to set up house in their garden instead and builds himself a giant sparkly web. Will this be the final straw for the family or will they see the spider as a potential pet after all? 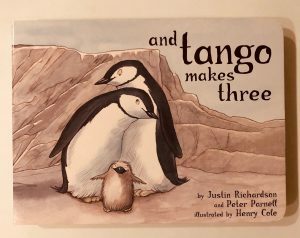 This gorgeous classic tells the true story of two very special male penguins at Central Park Zoo. Choosing to ignore the female penguins, Roy and Silo are inseparable. They sing together, bow to each other and go on little strolls around the penguin enclosure. When they see the other penguins pair up and build a nest of stones they do the same and snuggle up to sleep. Soon however they see that the other penguins all have eggs in their nests. They watch as the eggs grow then hatch, and they want a baby penguin of their own. Clever Roy spots a large round stone which looks just like an egg. He brings it home to Silo and they pop it in their nest. For days and days they take turns sitting on the egg, just as they have seen the other penguins do, but no baby penguin appears. 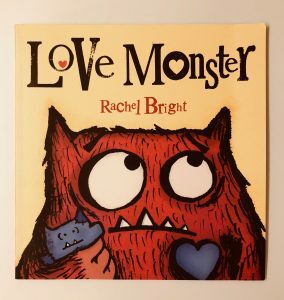 It’s Valentine’s Day so we thought we’d take the opportunity to share our favourite books which focus on love. 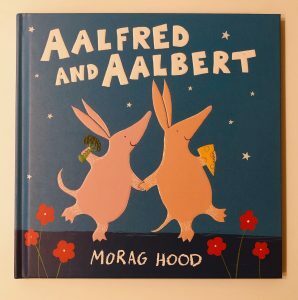 A lovely tale about two (male) aardvarks who are potentially a perfect couple, and the little blue bird who plays matchmaker. Cutesville is home to lots of cute and fluffy creatures, like puppies and bunnies and kittens. However it has one resident who is a tiny bit different – Monster. Monster isn’t cute or fluffy. He’s red and hairy with googly eyes and little pointy teeth. Everyone loves cute things, but nobody seems to love him. He looks so different to everyone in Cutesville that sometimes people point and laugh. This makes Monster sad as all he wants is for someone to love him.